FOUR YEARS CAN feel like a lifetime when you are a child. Since Spain 82 I had busied myself with playing organised football for the first time. Training with two under-14s teams, school teams, and the regional rep-team, I was starting out on my own journey as a footballer. My appreciation of the game had started to change; slight nuances that I was more aware of since starting to be coached. Obviously I still rejoiced in the back-heels and the overhead kicks, but now I could equally appreciate more simplistic skills such as receiving the ball with your back foot to create time and space for yourself. I was growing up. In the four intervening years since our last meeting, Diego Maradona had been on a life-affirming journey. Following his shameful dismissal against Brazil in 1982, the Argentine found himself struggling to adapt to life at a top European club, where success was not only demanded but also expected. A bout of hepatitis, a broken ankle following a challenge by Andoni Goikoetxea, and a mass brawl between players and officials of Barcelona and Athletic Bilbao at the end of the 1984 Copa del Rey final marred the Argentine’s turbulent stay in Catalonia. The escape route was another world record transfer fee of £6.9 million to Napoli of Serie A, at the end of the 1983-84 season; the birthplace of Catenaccio, Gaetano Scirea and home to his nemesis, Claudio Gentile. In the south of Italy, Maradona was adored by the citizens of Naples. Feeling loved and appreciated, El Diego honed his skills and learnt to moderate his temperament. Maradona was growing up. Mexico 86 should have been Columbia 86. A raging civil war, endemic violence and the obligatory drug problems, meant that a FIFA delegation pressured the Columbian government to withdraw its mandate to host the World Cup. In January 1983, the South American country duly obliged. After alleged internal FIFA politicking, Mexico was selected as the replacement host. September 1985: an earthquake reaching 8.0 on the Richter Scale shook Mexico City. There were 5,000 confirmed casualties, and some estimates put the number nearer to 10,000. Public buildings were destroyed, transport infrastructure was decimated and the estimated repair costs were $4 billion. This was the backdrop to the tournament, and if ever a World Cup finals needed a saviour, it was this one. Following their ignominious exit in Spain, Argentina had a different manager at a World Cup for the first time since 1974, and his name was Carlos Bilardo. In 1983 he had visited Maradona in Spain, who was recovering from his bout of hepatitis; while there, the man Diego calls El Narigon asked him to be his captain. At the time, Maradona was only 22-years-old, but César Luis Menotti’s replacement was intent on building the national side around its talisman. In the build-up to the tournament, the Argentine squad was in disarray. 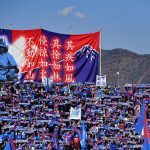 Qualification had only just been achieved and pre-tournament friendlies had not produced any performances that would serve notice for a successful World Cup. The final disruption saw icon and World Cup-winning captain, Daniel Passarella, walk out of the squad just prior to the opening group game. 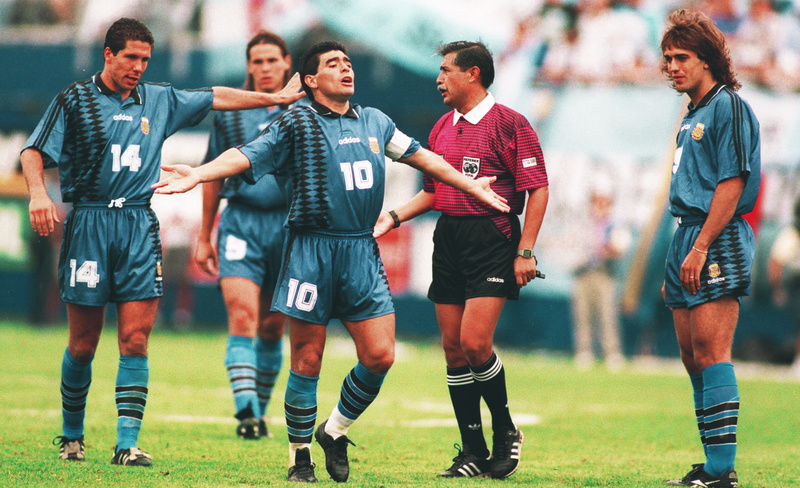 The defender never really came to terms with the captaincy being taken from him and handed to Maradona. So what was a perceived as an average Argentine team in poor form, and as yet an unknown starting line-up and a young captain, took to the field against South Korea in the opening group game. To begin with, the game looked like a replica of any of Argentina’s 1982 fixtures. The South Koreans opted for the tried and tested tactic of kicking Maradona, either before he got the ball, while he had it, or after he’d released it. But you sensed that this time it was different; there was no reaction from the 25-year-old. Frustration, yes, but also a steely determination to get up and get on with the game. Maradona’s refusal to react and have more and more of an influence on the game saw the Asian side resort to an early global introduction to their national sport, Taekwondo (it was only a demonstration sport at the 1988 Olympics in Seoul). 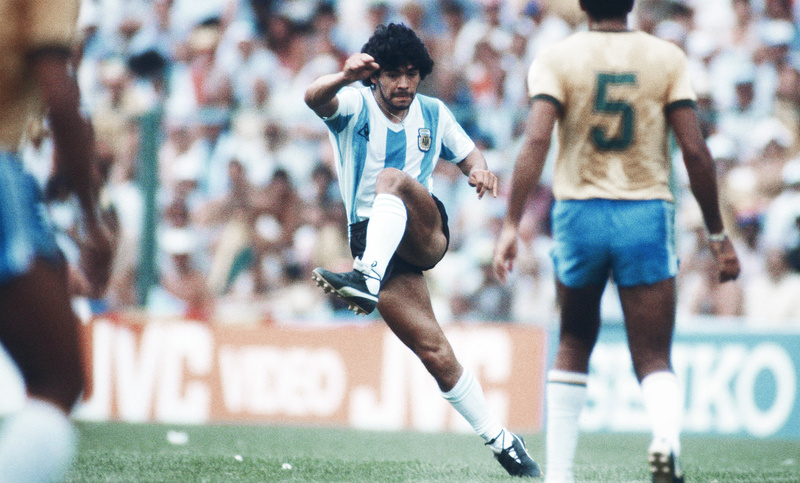 The challenges were coming in higher and higher up Maradona’s five foot six inch frame. The game finished 3-1 as Maradona assisted all three goals. His performance was outstanding, albeit against one of the tournament minnows. Brazil, my pre-tournament favourites, had played a day earlier in a rather uninspiring 1-0 win over Spain. Zico was injured going into the tournament, so I was starting with a clean slate, and anyone could claim my ‘undying affection’ for the next four weeks. As things stood, Maradona had put down the early marker. Could anyone match him? The second game saw Argentina face Italy in a repeat of the 1982 x-rated fixture, which saw Claudio Gentile nullify Diego Maradona via the medium of violence. 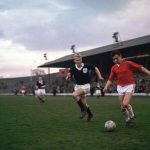 This would be the test – this game above all others would signify whether Maradona had matured into the world-class player everyone believed he was. For me, the game has additional significance in that my future stepfather brought me an old black and white portable television to put in my bedroom to watch the tournament on. The type with a circle of wire for an ariel and a dial which needs a finite touch to tune. If ever there was a way for a person to ingratiate themselves into my life, that was it. A television in my own room; I was set for the summer. So with the television tuned, I settled down to the first of many games on the 17-inch screen. Gentile was no longer a member of the Italian squad, but Scirea was still there and so was Pietro Vierchowod, an able if slightly less Machiavellian centre-half than Gentile. However, this was now a Maradona who was plying his trade in the lion’s den. Playing every weekend in Serie A for the last two years had certainly influenced the forward. It was a reformed character that took to the field. Despite going 1-0 down to an Italian penalty after six minutes, Maradona rallied his troops and took it upon himself to drag Argentina back into the game. This time the Azzurri couldn’t get near him as he was too quick and too clever for the Italians, drifting in and out of central positions so that the centre-backs didn’t know whether to go with him or hold their position. In the 36th minute a clipped pass over the Italian back four from Jorge Valdano had Maradona racing through in the inside left position, and with an instinctive side-foot volley; he guided the ball into the far corner. Maradona scored some great goals at the 1986 World Cup, but this was a goal of exquisite technique and ability. The change of stride and the height, at which he struck the ball, would have been impossible for most players. Maradona wheeled away and jumped the hoardings at the side of the pitch. Another impressive physical feat based on their size (and his). The ghost’s of 1982 had been vanquished with a subtle stroke of his left foot. The game finished 1-1 and now the world was starting to take notice of this Argentine team and their inspirational number 10. 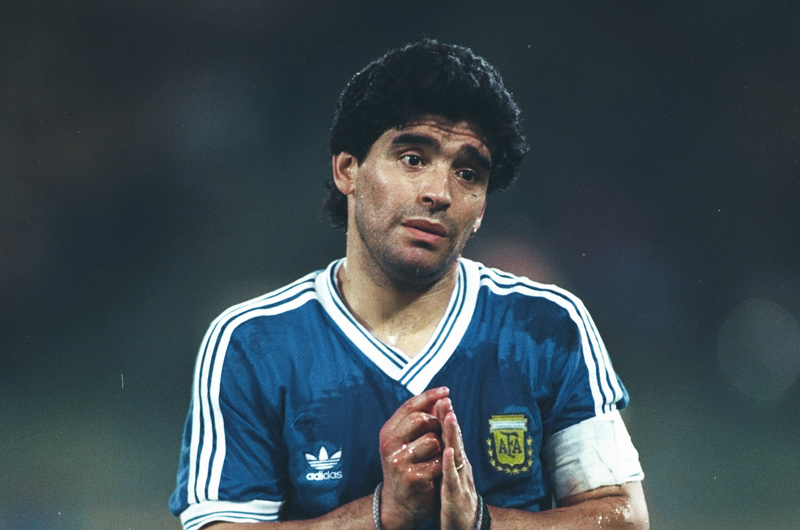 My mind was made up: Diego Armando Maradona would be my player of choice for the summer of ’86. The final group game saw a straightforward 2-0 victory against Bulgaria. Maradona created the second goal with a cross whipped in from the left, where Jorge Burruchaga couldn’t fail to score. Argentina finished top of the group and would face Uruguay in the second round. The initial uncertainty and unrest that had dogged their preparation was gone, and the Argentine side had become a tight unit willing to fight for each other. Argentina versus Uruguay is the South American equivalent of England versus Scotland. Separated only by the River Plate, the two countries contested the first World Cup final, which Uruguay won 4-2 in Montevideo. Since that game, football has been the tool of choice for both nations with which to demonstrate their superiority over each other. The game was a typically tense and scrappy affair, the occasion outweighing the performance. The football was only being played in fitful bursts, before an intentional misdemeanour once again halted the game. Argentina took a 1-0 lead in the closing minutes of the first half. 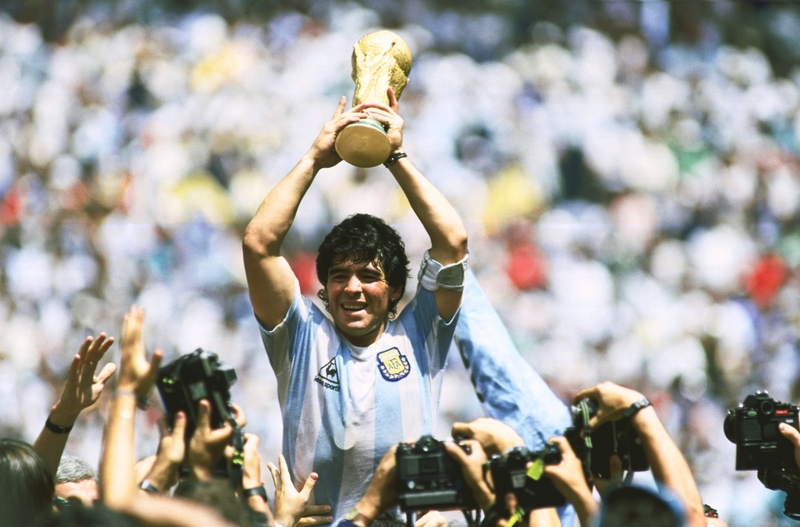 As the game wore on, Maradona was becoming more and more influential. It was the poise and balance with which he received the ball and then, in one or two touches, was away from his marker that had me agasp. I hadn’t seen a player have such sustained influence on games. The Brazil 1982 squad just rotated their brilliance amongst the whole team, but here was one man so far ahead of the other players on the pitch it was almost unfair. My predilection for not supporting a club did not extend to the international arena. I always wanted England to win; I accepted we didn’t have world-class players, but while they were in a tournament I would want the Three Lions to succeed. A poor start had been replaced by cautious optimism thanks to a rejuvenated Gary Lineker, who scored five goals in two games to set up a quarter-final clash with my new hero and his Argentine compadres. Kick-off was at midday local time, playing in the bright sun to suit the European viewing public. As it turned out, 22 June 1986 would leave one of football’s most indelible prints of all-time. During God Save The Queen the camera cuts to Maradona, who is looking at the England team. Dark eyes casting a disdainful glance up and down the English players, his face betrays the emotion of a nation that four years earlier had lost the Falklands War. Bobby Robson’s men innocently sung their anthem, while the Artful Dodger in blue decided how best to make the English pay. The dye was cast. The first half was a cagey affair, with Argentina the better side. England were more content with stopping Argentina rather than playing their own game. The 0-0 scoreline at half-time flattered England, but it was a case of so far so good, and the status quo of my favourite player against the team I wanted to win was being perfectly preserved. On 51 minutes, however, it happened. 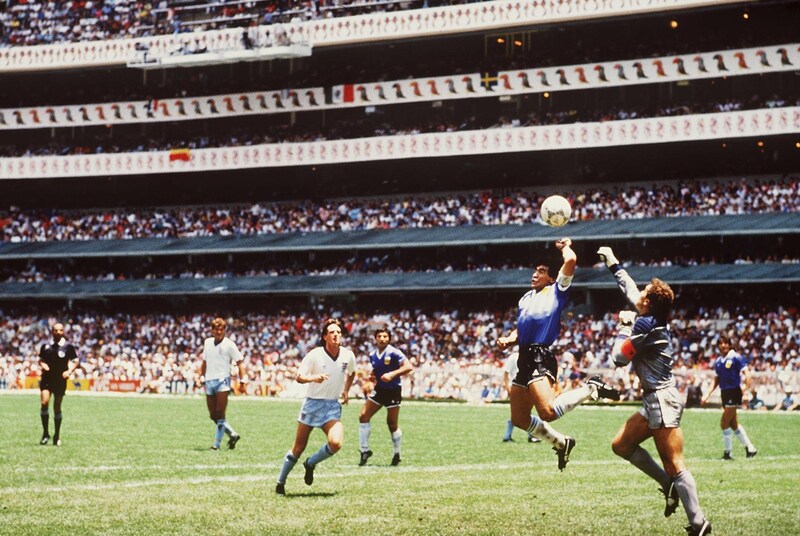 An attempted one-two by Maradona saw the ball loop off Steve Hodge towards Peter Shilton. Maradona continued his run and leapt to head the ball. Goal. If I’m honest, I didn’t see the handball as it happened, but after the first replay, I felt it start. The flushed face, the lump in the throat, eyes starting to sting, as I blinked away tears that I couldn’t believe I was producing. I slapped my left hand along with the England players, in the vain hope that an additional English protest would see the referee overturn his decision. How could he have done that to me? The personal injustice meted out by a player I thought was the best I’d ever seen was too much to handle. Almost 31 years later, I can appreciate that my feelings must have been insignificant in comparison to those of the England players on the pitch, but in that moment, in my house, it was a personal affront. On 55 minutes, it happened again: 10.8 seconds, 44 strides and 12 touches was all it took. For the first time in my life, I spontaneously stood up and applauded. It was genius; I couldn’t believe what I had seen. In the space of four minutes, a man on a different continent had rendered me crying with frustration, only to then instigate exuberant disbelief and admiration. It is said that memories are just snapshots of time, not a re-run of events in real time, but in those two incidents, I clearly remember everything – the physical feelings and the emotions. I could eulogise over that second goal all day, pick apart and discuss each of those 12 touches, the faints, and the jete stride between the four and four touch to maintain control. It was perfection. Argentina went on to win 2-1. The following days saw xenophobic comments splashed across all the English tabloid papers, while kids at school would try to punch the ball into the goal while shouting Maradona. What about the second goal? Why did I seem to be the only person trying to replicate the pirouette, which set the Argentine captain on his way towards goal? Not for the last time did I value performance of the beautiful game over the result. Argentina were now unstoppable, the semi-final against Belgium was merely a stepping-stone in what seemed to be Argentina’s pre-ordained destiny to win the World Cup. Maradona scored another two goals in a comfortable 2-0 win. The first was an almost converse replica of the goal against Italy. This time, it manifested via a run into the inside-right channel and a volley with the outside of the left foot into the far corner. The second goal was a poor man’s version of his goal against England, this time with fewer touches and less distance covered. A goal of the tournament contender at any other finals, such was the standard of the goal against England that many overlook his effort against Belgium. The final saw Argentina take on the efficient West Germans. They had barely registered on my radar throughout the tournament and were functional rather than inspirational. Lothar Matthäus – the man Maradona would later claim as the best player he ever came up against – was the final throw of the dice for the rest of the world in their quest to stop El Diego. Matthäus probably did a better job of stopping Maradona play than anyone else had done in the tournament, but by now, the rest of the Argentine team were filled with so much confidence that they seemed to collectively acknowledge it was their turn to secure victory. Argentina scored in the 23rd minute through full-back José Brown, to go in at half-time 1-0 up. The tie looked to be over after Jorge Valdano produced a composed finish after 55 minutes. The Germans, however, have a reputation for resilience and two quick goals, 74 and 81 minutes, suddenly had Bilardo’s men questioning themselves. How could they get to within nine minutes of winning the World Cup after dominating the tournament and then throw it away? The only way the story could have ended better is if Maradona scored the third and final goal. Instead it was a sublime first-time pass from the number 10 which split the entire West German midfield and back-four. Jorge Burruchaga raced clear and calmly slid the ball past Harald Schumacher to make it 3-2. Argentina had gone from perceived no-hopers to world champions. Never before had a tournament been influenced by just one player. Never had one man made such a difference to a team. There have been great players at many World Cups – Pelé and Johan Cruyff to name just two – but they were all part of a great team. I doubt very much there will be a tournament dominated by one player to such an extent ever again. Maradona arrived at Mexico 86 as a player on the cusp of either becoming one of the world’s best or one of the world’s greatest. He left the tournament, in my opinion, as the greatest player of all time. How could such a performance be followed? *Maradona hit the crossbar with a free-kick and had a goal wrongly disallowed.